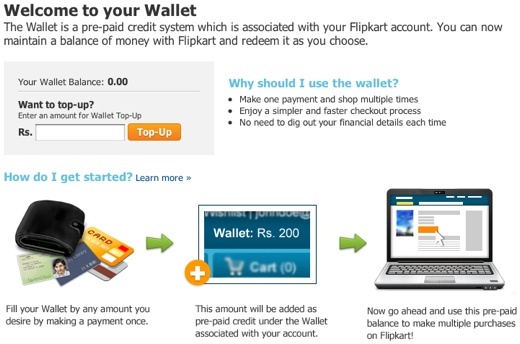 Flipkart has added a prepaid Wallet feature to its e-commerce platform that allows shoppers to store money on the site and use it to purchase items, without having to reach for their credit card for each transaction, according to a MediaNama report. Flipkart, the first billion dollar Internet company from India, is by far the leading online store in the nation. Founded by former Amazon employees Sachin and Binny Bansal in 2007, it expects to increase its sales tenfold in the ongoing fiscal year to about $100 million by March 2012. It already offers shoppers the convenience of Cash on Delivery (CoD), using which they can choose to pay for purchases in cash when they have been delivered to their doorstep. This is in addition to the usual credit and debit card and net banking options that the service also offers to online shoppers. The newly launched Wallet aims to make online payments easier and more secure for customers by sparing them the hassle of fetching their credit/debit card or net banking details every time they want to purchase an item. Shoppers can fill their Wallets with up to ₹10,000 ($190) and then use it across multiple purchases. For purchases that exceed the amount of cash available in the Wallet, Flipkart will gladly accept partial payment from the Wallet and the rest from other sources. The Wallet has no expiry date and money once stored in it can be refunded back to the payment source if the customer so wishes. Besides not having to enter their financial details repeatedly, it also makes the process faster and more reliable by removing the need to go through payment gateways during every checkout. Parents might find the feature especially helpful, as they can fill their kid’s Flipkart Wallet and then not have to worry about overspending or credit card theft.